HiTemp UR Medical Sheepskin Superior Overlay= BEST This 30" x 60" Superior Hitemp UR Medical Sheepskin Overlay is made from HiTemp UR Medical Sheepskin..the BEST! 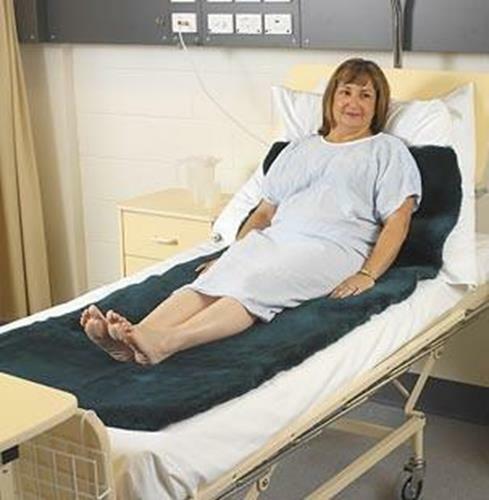 The luxurious dense 30mm wool pile reduces pressure, skin moisture and shear- the 3 major causes of Pressure Sores, Bedsores and Decubitus Ulcers. The overlay is usually placed on the bed sheet. Suitable for incontinent users. Best Pressure Sore Prevention is achieved if the body is in direct contact with the wool. The Superior HiTemp UR Medical Sheepskin Overlay is large enough to provide comforting Pressure Sore Prevention for the whole body- from the head to the feet. 1.0L Measuring bottle of Woolskin - the Wool Shampoo with Tea Tree Oil. Provides the best care for this Superior Bedsore Prevention Package. Machine washable on the Gentle/Wool Cycle. We recommend that you air dry..not in the sun or near direct heat. Brush after drying. 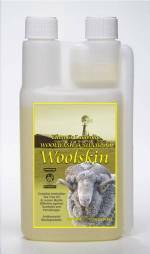 Wash in Woolskin to condition and disinfect the wool and leather. FREE shipping to Canada and Lower 48 States.